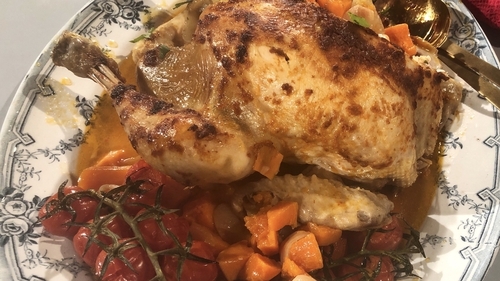 This One Pot Harissa Roast Chicken dish will keep the whole family happy. Quarter the onion. Peel and roughly chop the carrots and sweet potatoes into chunks. Place the vegetables into the bottom of a large casserole or heavy based pot. Place the chicken on top. Mix the harissa paste with the olive oil and spread it over the chicken. Season with salt and pepper. Pour the vinegar and water over the vegetables. Place a lid on the pot and cook in the preheated oven for an hour. Remove the lid and baste the chicken with the juices. Add the cherry tomatoes around the chicken. Leave the lid off and cook for a further 30 minutes. Ensure the chicken is cooked through before scattering generously with the chopped coriander.